Happy Friday Tampa Bay, Alex here with some exciting restaurant news. 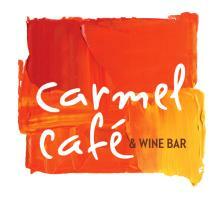 Carmel Café & Wine Bar is now open Mondays for lunch and dinner and has expanded its&apos; weekend brunch at both locations. You now have the option to enjoy great cuisine for lunch, dinner and/or for a nice weekend brunch. The new days and hours of operation are listed below. Lunch from 11:30 a.m. – 2:30 p.m. Monday – Friday. Dinner from 5 - 10 p.m. Monday - Thursday, 5 p.m. - midnight Friday and Saturday and from 5 – 9 p.m. on Sunday. Weekend brunch from 11 a.m. – 2:30 p.m. Saturdays and Sundays. Carmel Café & Wine Bar has asignature Mod Med cuisine that is inspired by the flavors and cultural influences of Mediterranean countries like Italy, Spain, France, Greece and Morocco. The popular Mod Med menu features small and large plate options. Wines are available in three-, six- and nine-ounce servings, or by the bottle. You may also choose from a global selection of wines designed to easily mix and match with the menu, while you enjoy live music at both restaurants on Friday and Saturday evenings. Make you reservations today by calling the Countryside Carmel Café & Wine Bar at 727-724-4228, 2548 or the Carrollwood Carmel Café & Wine Bar at 813-265-1415. Enjoy a wonderful brunch, lunch or dinner at Caramel Café and Wine Bar. Enjoy your weekend! Check back with us often for more information on Tampa Bay Dining.